1. What was Adam formed from? 2. When God breathed into Adam's notrils, what did he become? 3. What did God put Adam into the Garden of Eden to do? 4. What did God say it was not good for Adam to be? 5. What did God take from Adam to make Eve? 6. What Adam said Eve would be called? ? 7. What was the name of the tree they were not to eat of? 8. What did the serpent tell Eve surely would not happen? 9. How did they feel when they knew they were naked? 10. What did God make to cloth them with? ? Question 1: Dust Answer 2. Question 2: A Living Soul Answer 2. Question 3: Dress and Keep it Answer 1. Question 5: Rib Answer 2. Question 6: Woman Answer 3. Question 7: Knowledge of Good and Evil Answer 3. Question 8: Die Answer 2. Question 9: Afraid Answer 2. Question 10: Coats of Skins Answer 1. 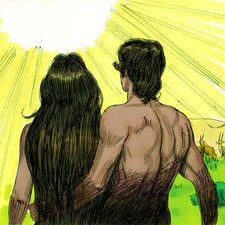 If you enjoyed Bible Trivia Questions Adam and Eve please like and share this page. See buttons below.